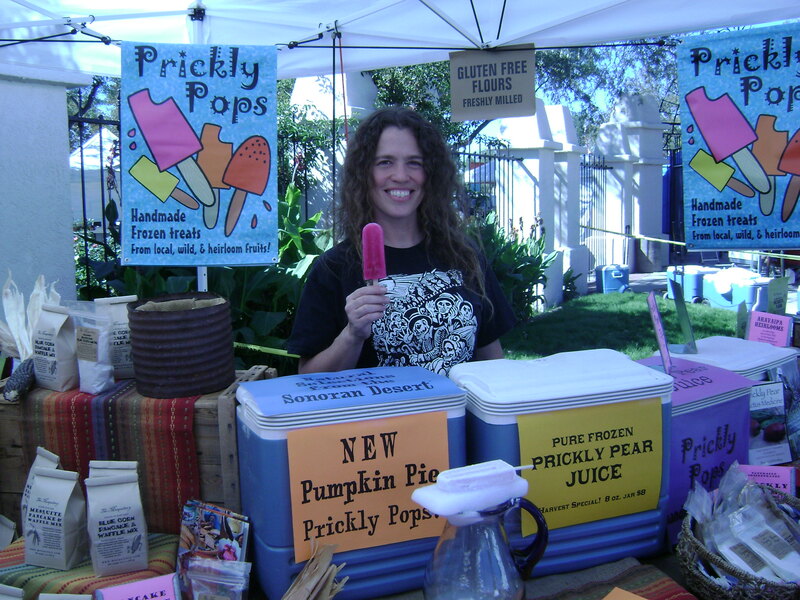 Jeau Allen is ready to try one of her own prickly pops. If you’d like to try cooking with desert foods, but missed the harvest this year or don’t have the time or inclination to go out gathering, Jeau Allen has done the hard work for you. She and her husband Charlie live in the desert at the west end of Aravaipa Creek where they gather and prepare all manner of delicious wild edibles. For from-scratch cooks, they sell five (yes!) kinds of mesquite meal, frozen prickly pear juice, blue corn meal, chia seed and tepary bean flour. If you’d like some of the assembly already done for you, there are baking mixes with mesquite meal, mesquite jelly and syrup, and saguaro fruit spread. And oh, those frozen treats — on any day she might have prickly pear, mesquite, watermelon, pumpkin pie, Mexican chocolate or wherever her culinary whim carried her that week. You can find Jeau and Charlie selling their wares in Tucson at the Santa Cruz River Farmer’s Market on Thursdays from 3-6 p.m., at the Oro Valley Farmer’s Market on Saturday mornings from 9 a.m.-1 p.m., and at the Tucson Farmer’s Market at St. Philip’s Plaza Sundays from 9 a.m.-1 p.m. Check out their websites for more intriguing foods at www.pricklypops.com and www.mesquiteflour.com. If you need some recipes to use that delicious mesquite flour or prickly pear juice you get from Jeau, try my latest cookbook Cooking the Wild Southwest: Delicious Recipes for Desert Plants available in local bookstores and on-line sources. For inspiration, watch the video at http://www.youtube.com/watch?v=sQSh4pK56i4. I have stopped at this booth at the Farmer’s Market at the Mercado San Agustin. The mesquite mixes are delicious and easy. Great stuff at this booth. Definitely worth a visit next time you’re at the St. Philips farmers’ markets.